I wish I were a better tractor driver. Actually, I’m better than I was. It’s been a while, for example, since I hit even a glancing blow on one of the posts while pulling into and out of the pole barn. But I’m nowhere near good enough. Here’s the latest: on Saturday afternoon while bush hogging the yard north of the lodge, I hit a glancing blow on the fire pit. Knocked the poor bugger to smithereens. 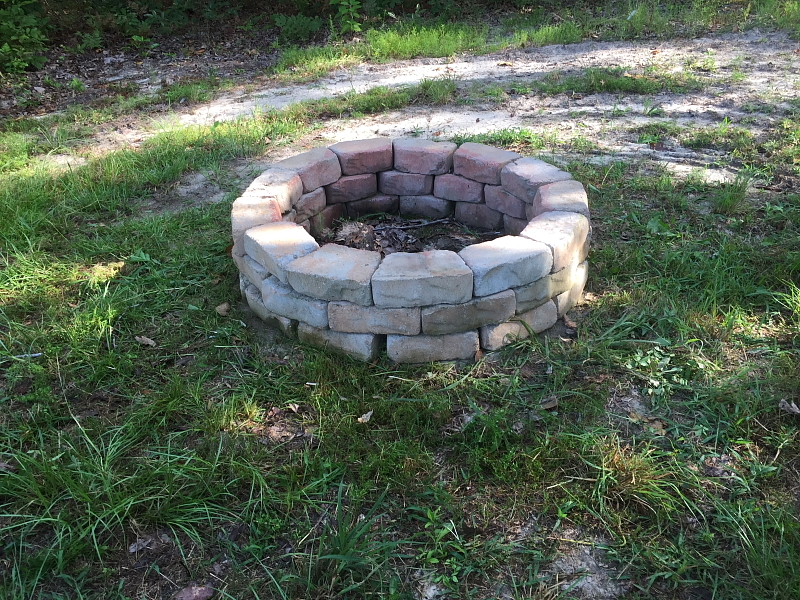 It was too hot and the sun too direct to try to repair it Saturday, so first thing Sunday I used the shade from the nearby grove and rebuilt the firepit. Took me 17 minutes. It may not look like it in the photo because the ground, like so much of our terrain, makes everything look a little crooked, but the pit as rebuilt is pool table level. 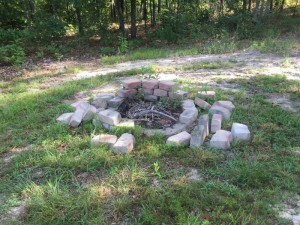 Because rebuilding a fire pit is a mindless task, I pondered as I worked the advantages of simply stacking the bricks for the pit instead of trying to cement them in place. Had I used mortar as so many do, there’s a chance the tractor might not have damaged it. A really slim chance. We’re dealing here with the power of 53 horses pulling simultaneously, with determination, and in one direction. My guess is that the blow would have demolished at least a corner of the fire pit and in the process would have damaged several bricks. And those bricks would have been coated irregularly with mortar. I bet I would have needed to rebuild the fire pit anew, perhaps with new bricks. No brick was injured or harmed in any way Saturday. They just slid away from the blow and settled in a heap. Hence the simple, quick repair job. I’m learning that sometimes it’s better to build less strength rather than more. And yes, I’m learning to be a better tractor driver. Really, I am. Next Next post: The New Chicken Tractor is Basically Finished!